Marine zoological studies of various sea creatures. 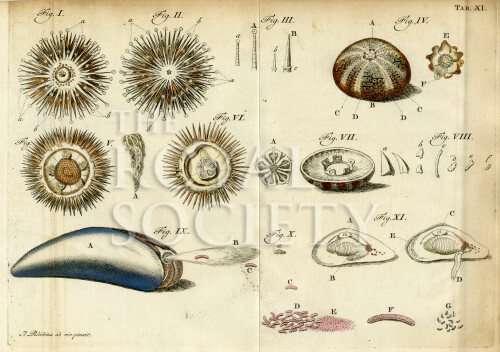 Figures 1-8: Sea urchins, Echinozoa. Figures 9-11: Mussels, Mytilus. Each set of figures has details of anatomical structures, including the ovum and eggs of the mussel, with magnified images viewed by microscope. Job Baster (1711-1775) Dutch physician and naturalist, was elected a Fellow of the Royal Society in 1738.